It seem blogger system was interrupted this morning when I uploading additional images for DC series. 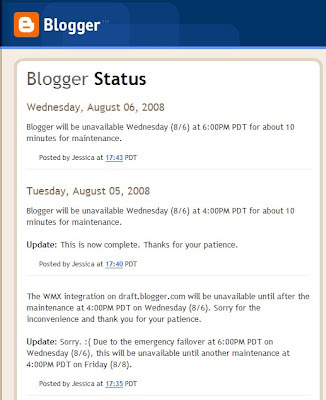 From the announcement, blogger is under maintenance work for 10 minutes this morning. Blogger is under Google group should have world's class standard, but in the IT world there is nothing is "undownable" or in other word 100% up time. Since Blogger services are given free to me, I think I can bear with it.